The Index of Small Business Optimism increased in August by .9 points to 108.8. Further details regarding small business conditions can be seen in the full August 2018 NFIB Small Business Economic Trends (pdf) report. This entry was posted in Business and tagged small business on September 11, 2018 by Ted Kavadas. The Index of Small Business Optimism increased in May by 3 points to 107.8. • Compensation increases hit a 45-year high at a record net 35 percent. • Positive earnings trends reached a survey high at a net three percent. • Positive sales trends are at the highest level since 1995. • Expansion plans are the most robust in survey history. Further details regarding small business conditions can be seen in the full May 2018 NFIB Small Business Economic Trends (pdf) report. This entry was posted in Business and tagged small business on June 12, 2018 by Ted Kavadas. The Index of Small Business Optimism increased in February by .7 points to 107.6. 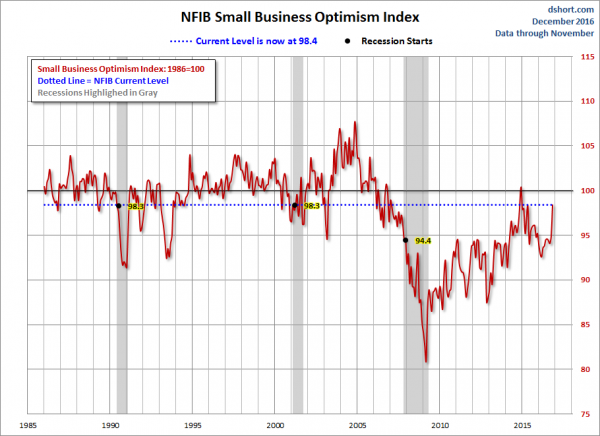 Small business owners are showing unprecedented confidence in the economy as the optimism index continues at record high numbers, rising to 107.6 in February, according to the NFIB Small Business Economic Trends Survey, released today. The historically high numbers include a jump in small business owners increasing capital outlays and raising compensation. Further details regarding small business conditions can be seen in the full February 2018 NFIB Small Business Economic Trends (pdf) report. This entry was posted in Business and tagged small business on March 13, 2018 by Ted Kavadas. 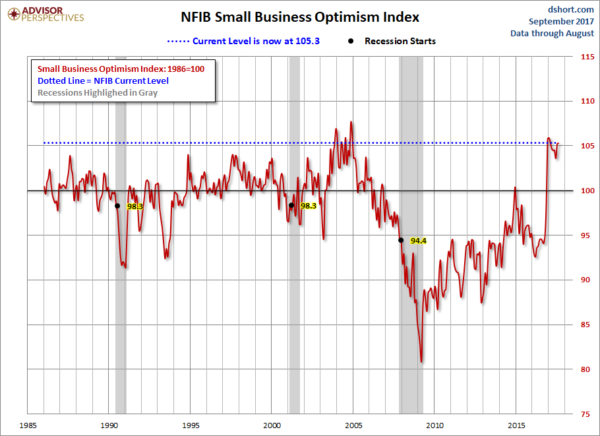 The Index of Small Business Optimism increased in November by 3.7 points to 107.5. After several solid quarters, job creation slowed in the small business sector as business owners reported a seasonally adjusted average employment change per firm of 0.0 workers. Thirteen percent (down 1 point) reported increasing employment an average of 3.0 workers per firm and 10 percent (down 1 point) reported reducing employment an average of 2.9 workers per firm (seasonally adjusted). Fifty-two percent reported hiring or trying to hire (down 7 points), but forty-four percent (85 percent of those hiring or trying to hire) reported few or no qualified applicants for the positions they were trying to fill. Eighteen percent of owners cited the difficulty of finding qualified workers as their Single Most Important Business Problem (down 2 points), second only to taxes. This is the top ranked problem for those in construction (33 percent) and manufacturing (22 percent), getting more votes than taxes and the cost of regulations. Thirty percent of all owners reported job openings they could not fill in the current period, down 5 points from the record-high level reached in July and October. Eleven percent reported using temporary workers, down 3 points. A seasonally adjusted net 24 percent plan to create new jobs, up 6 points to a record high reading. Hiring plans were strongest in professional services, manufacturing and construction. Reports of higher worker compensation were unchanged at a net 27 percent, historically very strong all year. Owners complain at record rates of labor quality issues, with 85 percent of those hiring or trying to hire reporting few or no qualified applicants for their open positions. Eighteen percent selected “finding qualified labor” as their top business problem, far more than cite weak sales. Plans to raise compensation fell 4 points in frequency to a net 17 percent, still a solid number, but a surprise as labor markets seem to be getting tighter. The frequency of reports of positive profit trends improved 2 points to a net negative 12 percent reporting quarter on quarter profit improvements, a solid reading historically, among the best since 2007. Further details regarding small business conditions can be seen in the full November 2017 NFIB Small Business Economic Trends (pdf) report. This entry was posted in Business and tagged small business on December 12, 2017 by Ted Kavadas. The Index of Small Business Optimism increased in August to 105.3. According to NFIB Chief Economist Bill Dunkelberg, the August figures for capital outlays are typical of a growing economy. Small business owners reported a seasonally adjusted average employment change per firm of 0.18 workers per firm over the past three months, virtually unchanged from July. Fourteen percent (up 1 point) reported increasing employment an average of 4.4 workers per firm and 12 percent (up 1 point) reported reducing employment an average of 2.4 workers per firm (seasonally adjusted). Fifty-nine percent reported hiring or trying to hire (down 1 point), but 52 percent (88 percent of those hiring or trying to hire) reported few or no qualified applicants for the positions they were trying to fill. Nineteen percent of owners cited the difficulty of finding qualified workers as their Single Most Important Business Problem (unchanged), second only to taxes. Labor quality is the top ranked problem in Construction (33 percent) and Manufacturing (25 percent), receiving more votes than taxes and regulatory costs. Thirty-one percent of all owners reported at least one job opening they could not fill in the current period, down 4 points but a very high reading. A seasonally adjusted net 18 percent of owners plan to create new jobs, off 1 point from July but historically very strong. Three percent of owners reported that all their borrowing needs were not satisfied, unchanged and historically very low. Thirty-four percent reported all credit needs met (up 3 points) and 49 percent explicitly said they were not interested in a loan, down 2 points. Including those who did not answer the question, 63 percent of owners have no interest in borrowing, down 3 points. Thirty-one percent of all owners reported borrowing on a regular basis (up 1 point). The average rate paid on short maturity loans was down 40 basis points at 5.5 percent, little changed even as the Federal Reserve raises rates. Further details regarding small business conditions can be seen in the full August 2017 NFIB Small Business Economic Trends (pdf) report. This entry was posted in Business and tagged small business on September 12, 2017 by Ted Kavadas. 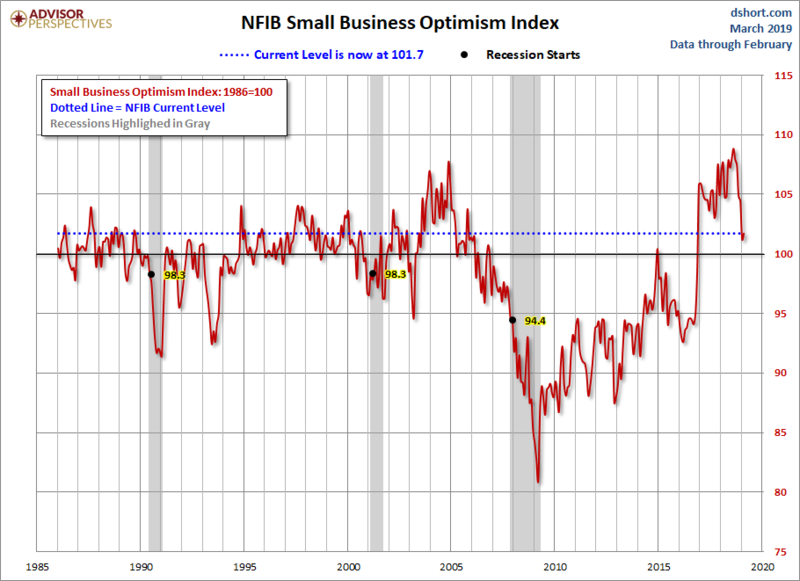 The Index of Small Business Optimism was unchanged in May at 104.5. Only 3 percent of owners reported that all their borrowing needs were not satisfied, unchanged and historically very low. Thirty-one percent reported all credit needs met (down 1 point), and 51 percent explicitly said they did not want a loan. Only 1 percent reported that financing was their top business problem compared to 22 percent citing taxes, 19 percent citing the availability of qualified labor, and 13 percent regulations and red tape. Twenty-eight percent of all owners reported borrowing on a regular basis (down 3 points). The average rate paid on short maturity loans was up 50 basis points to 5.9 percent. Further details regarding small business conditions can be seen in the full May 2017 NFIB Small Business Economic Trends (pdf) report. This entry was posted in Business and tagged small business on June 13, 2017 by Ted Kavadas. 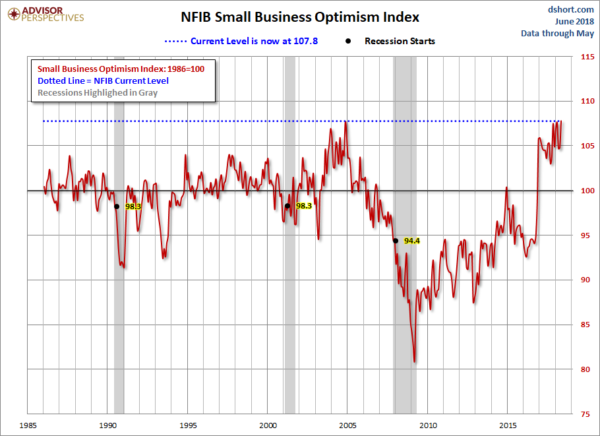 The Index of Small Business Optimism decreased .6 points in February to 105.3.
Business owners reporting higher sales improved four percentage points, rising to the first positive reading since early 2015. The percent of owners expecting higher real sales fell three points to a net 26 percent. This follows a 20-point rise in December and remains positive. Capital spending among small business owners rose two points to 62 percent, the second highest reading since 2007. Owners reported spending on new equipment, vehicles, and improvement or expansion of facilities. The percent of owners planning capital outlays slipped one point to 26 percent. Duggan said after years of ball-and-chain regulation and poor economic growth, small businesses are ready to invest. Three percent of owners reported that all their borrowing needs were not satisfied, down 1 point. Thirty percent reported all credit needs met (down 1 point), and 52 percent explicitly said they did not want a loan. However, including those who did not answer the question, uninterested in borrowing, 67 percent of owners have no interest in borrowing. Record numbers of firms remain on the “credit sidelines”, seeing no good reason to borrow yet, in spite of the surge in optimism. As optimism is translated into spending plans, borrowing activity should pick up. Only 2 percent reported that financing was their top business problem compared to 22 percent citing taxes, 15 percent citing regulations and red tape, and 17 percent the availability of qualified labor. Weak sales garnered 12 percent of the vote. Further details regarding small business conditions can be seen in the full February 2017 NFIB Small Business Economic Trends (pdf) report. This entry was posted in Business and tagged small business on March 14, 2017 by Ted Kavadas. The Index of Small Business Optimism increased 3.5 points in November to 98.4. 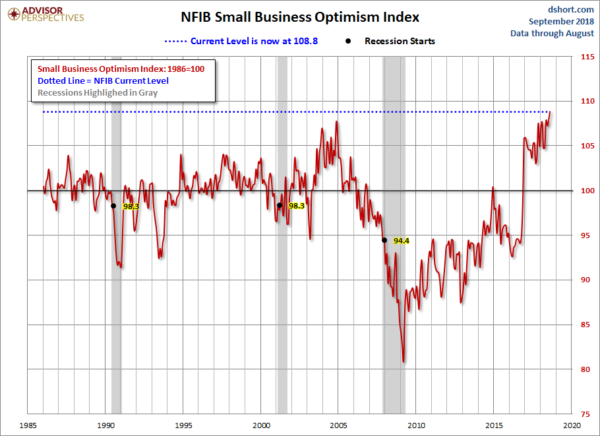 Small business optimism remained flat leading up to Election Day and then rocketed higher as business owners expected much better conditions under new leadership in Washington, according to a special edition of the monthly NFIB Index of Small Business Optimism, released today. Reported job creation remained weak in November with the seasonally adjusted average employment change per firm posting a gain of 0.02 workers per firm, positive, but barely. Fifty-eight percent reported hiring or trying to hire (up 3 points), but 52 percent reported few or no qualified applicants for the positions they were trying to fill. Sixteen percent of owners cited the difficulty of finding qualified workers as their ‘Single Most Important Business Problem’. Thirty-one percent of all owners reported job openings they could not fill in the current period, up 3 points and the highest reading in this recovery. The increase accurately predicted the decline in the unemployment rate from what many already call a “full employment” level. Sixteen percent reported using temporary workers, up 1 point. A seasonally adjusted net 15 percent plan to create new jobs, up 5 points from October and the strongest reading in the recovery. Four percent of owners reported that all their borrowing needs were not satisfied, unchanged from October. Thirty percent reported all credit needs met (up 1 point), and 52 percent explicitly said they did not want a loan, down 1 point. Only 2 percent reported that financing was their top business problem. Thirty-one percent of all owners reported borrowing on a regular basis (up 3 points). The average rate paid on short maturity loans rose 40 basis points to 5.6 percent. Overall, loan demand remains historically weak, owners can’t find many good reasons to borrow and invest, even with abundantly cheap money. Further details regarding small business conditions can be seen in the full November 2016 NFIB Small Business Economic Trends (pdf) report. This entry was posted in Business and tagged small business on December 13, 2016 by Ted Kavadas.